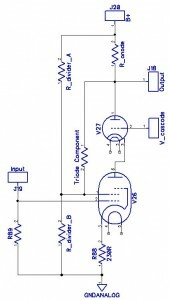 Ever mused about a “Straight Wire With Gain” ? If you have ever implemented a Push-Pull topology with an Ultra-Linear architecture in the output stage, you have actually made a fair attempt at “linearizing” the output stage of your amplifier. If you strap a pentode in “pentode mode”, you basically provide a fixed DC voltage to the S2 grid. In terms of AC, the fixed DC voltage is equivalent to an AC ground. In other words, look at the picture on the left: you are basically providing 0% feedback of the AC output signal swing. Why 0% ? Because the B+ is essentially an AC ground. You have no AC signal swing at the B+ connection. B+ is essentially an AC “ground”. On the other hand, if you strap a pentode into “triode mode”, you basically connect S2 with the anode, hence providing 100% of the signal swing, as experienced on the anode, back to the S2 grid. Look at the middle picture: this is a pentode strapped in “triode mode”, with 100% of the signal of the anode reflected back to the S2 grid. On the right hand side of the drawing, we have an “intermediate” position, from which the S2 resistor taps its “feedback” voltage. Within literature, it is a well documented and known fact, that some popular output tubes, pentodes, benefit from a tapping at about 43% of the total winding length. This is called “Ultra-Linear”. Why is this beneficial ? Look at the typical anode curves of a “triode” (or a pentode strapped up in “triode mode”). Such curves are of the “belly down” type. Starting slow, and then growing steeper and steeper. Now, look at the typical anode curves of a “pentode” working in “pentode mode”. Such curves are of the “belly up” type. Initially they rise fairly steep, but then they flatten out. So, it has been reasoned, and rightfully so, that you can take a bit of the former, mix it with a bit of the latter, make a superposition, or an “intermediate” mix between the two, and arrive at resultant graphs that indeed are somewhat more linear than either a pure triode or a pure pentode. c). a lower amount of distortion, typical to that of a “pure triode”. UL is very typical a topology for output stages. Push-Pull Speaker Output Transfomers often are made with Ultra-Linear tappings. Actually, it is also perfectly possible to do a SINGLE ENDED amplifier, which also uses the same concept. 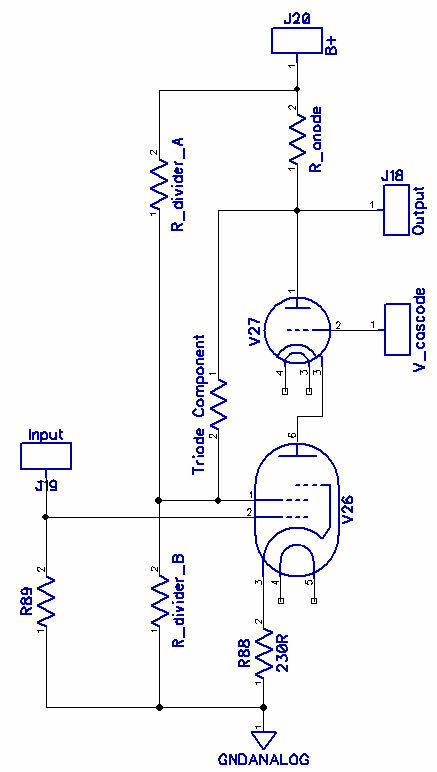 Ever seen a SET amplifier, based on a pentode, with an Ultra-Linear tapping on the transformer? No reason why such a contraption should not work. I did not see one yet, most probably because that the majority of the SET philosophy audiophiles are die hard admirers of pure and true triodes in their output stages. Using a pentode in a SET configuration would probably sound like sheer blasphemy. OK. So we now know that UL is good for the output stage. But what about the critical input stage? Ever thought about doing “ultra-linear” in the INPUT stage? … we make a UL tapping at 43% of a pair of voltage divider resistors ? This picture essentially resembles the three cases as on the former one. But this time, we do not have an output transformer with UL tapping. Here, we have a split anode resistor, consisting of two distinct resistors: R_a and R_b. From the anode’s point of view, the anode sees a load resistor of a value of R_a plus R_b, slightly messed up by a miniscule current flowing to/from the S2 resistor and S2 grid. The first picture to the left: represents “pure pentode” mode, with 0% feedback of signal to the S2 grid. The middle picture: depicts “pure triode” mode, with 100% feedback of the signal back to the S2 grid. The right hand side picture represents my concept of an “ultra-linear” mode for this pentode. Now, in some cases, there may be an issue here, as the S2 grid, as in some of the pentodes, actually requires a fixed screen voltage, of a potential much lower, or of an intermediate value, than the B+ voltage, or even of the DC component of the anode voltage. In such instances, the left picture of those topologies presented below would exceed the maximum permissible voltage that is applicable to the S2 screen grid. Therefore, typical user applications are designed around the notion of a S2, or screen grid voltage supply, a very well filtered supply, providing an optimum amount of volts to the S2 grid, a voltage essentially lower than the anode voltage. Have a look at the middle picture. Here we have a typical case of a voltage divider network, which creates a “fraction” of the B+ voltage, for the purpose of providing it as a fixed screen voltage to the S2 grid. This voltage needs to be well filtered, hence the filtering capacitor C.
But wait a second … from this moment onward, it seems that Ziggy has started fooling around again. Indeed, What the S2 grid “sees” on the middle picture, is something of an “ultra-linear” thing. The “pentode_component” resistor – provides a certain degree of a fixed voltage to the screen grid. This is essentially what you would do, if you want to work in “pentode mode”. But then, in “parallel” to that resistor, there is also the “Triode_Component” resistor, one which provides a fair share of the anode voltage swing, back to the S2 grid. This, in essence, is a representation of what you would normally strap up the pentode, if you wanted it to work in “triod mode”. Here, we have a bit of both. Let us assume that the top of the capacitor is a fair approximation of AC signal ground, and that the fraction of the B+ voltage is well filtered at that point, with no AC signal component upon it. By manipulating the proportion of: R_pentode_component to (R_pentode_component + R_triode_component), I am hoping that I can emulate an Ultra-Linear mode of operation for this tube. 43% = Optimal_Split = R_pentode_component / ( R_pentode_component + R_triode_component). Optimal_Split * R_pentode_component + Optimal_Split * R_triode_component = R_pentode_component. R_pentode_component * ( 1 – Optimal_Split ) = Optimal_Split * R_triode_component. R_pentode_component = R_triode_component * Optimal_Split / ( 1 – Optimal_Split ). Why would I want to know the R_pentode_component resistor as a function of the R_triode_component resistor ? Well, I can already imagine all those audiophiles screaming their lungs out, that “HEY ! you are essentially killing the gain of the stage, because the R_triode_component resistor is essentially, signalwise, in parallel to the Anode Load resistor, and it is detrimental to the overall gain of the stage. OK, but what if I do not need a cosmic value of gain, to start off with ? 100K * 1000K / (100K + 1000K) = 90,9 K … less than 10% difference. I can live with that. If we can live with the R_triode_component of say 1 Meg, then our R_pentode_component = 750K. (R_divider_A || R_divider_B) + R_triode_Component. This would probably allow to prep up the resistor value of R_triode_Component to an even higher value. Obviously, the resistor values would need to be recalculated, to accout for the higher “DC” component, a higher elevation of the voltage of the Cascode’s anode. Your … Feedbacks – Kindly Welcome !